Investing in global arena is essential in current market. There are many vehicles to start this investment such as through global bond, and world stock / global equity. Mutual funds can provide an instant medium to achieve this diversification investment. In this article, I will provide one the best mutual fund in World Stock category. World stock fund is an equity mutual fund invest primarily in companies located in various countries such as US (United States of America), Europe (Germany, France, Italy, United Kingdom, Spain, Switzerland, etc), Pacific (Japan, Australia, Korea), and many globes smaller markets. This fund can certainly represent world economy in our investment portfolio. One of the best rated world stock funds is Mutual Global Discovery fund. Details about this fund can be found below. This Mutual Global Discovery A fund is part of Franklin Templeton Investments fund. The Mutual Global Discovery fund objective is to provide capital appreciation. The fund invests majority of assets in undervalue equity securities (including convertible securities and preferred stock) of U.S. and foreign companies based on investment manager criteria. This fund also invests in merger arbitrage stocks and distressed companies. The fund expects to invest substantially and may invest up to 100% of its assets in foreign securities, which may include sovereign debt and foreign government debt. This fund’s manager is Philippe Brugere-Trelat since December 2009. During his tenure in managing TEDIX, Philippe has brought this fund with 11 years in positive territory and 3 years in negative territory. The best fund performance occurred in 2003 with 31.13% and the worst performance was in 2008 with -26.73%. The fund has 5-stars Morningstar rating. It has 6.78% year-to-date return as of May 2011. The 1-year load adjusted returns of this fund is 14.01%. The fund expense ratio is 1.34% per year, compared to the average of the category which is 1.49% per year. This fund is available to any new investor with brokerage and IRA accounts. To invest in this Mutual Global Discovery fund, investor or trader will need $1,000 initial balance to fund this purchase in brokerage account and $250 in IRA account. Then, investor can invest with no minimum to subsequent investment. 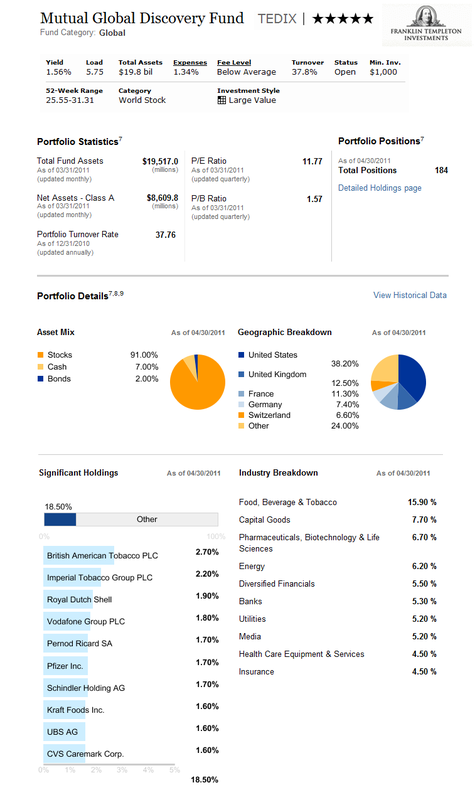 This fund does have 0.30% management fee and 5.75% sales load fee. The TEDIX fund can be purchased from 117 brokerages, include Fidelity Retail FundsNetwork, JP Morgan, DATALynx IMS, Commonwealth, Merrill Lynch, etc. The fund turnover rate is 37.76%. Other classes of this Franklin Templeton fund include Share Class B (TEDBX), Share Class C (TEDSX), Share Class R (TEDRX), and Share Class Z (MDISX). The class Z has the lowest expense ratio with 1.04%. This fund doesn’t have any sales load or 12b1 fee. The top 10 holdings of this top rated international stock fund as of June 2011 are British American Tobacco Plc, Imperial Tobacco Group Plc, Royal Dutch Shell, Vodafone Group Plc, Pernod Ricard SA, Pfizer Inc, CVS Caremark Corp, Schindler Holding AG, Merck & Company Inc, and Lorillard Inc. The top 8 industry sectors of this fund are Food Beverage & Tobacco, Capital Goods, Pharmaceuticals / Biotechnology & Life Sciences, Energy, Banks, Insurance, Diversified Financial, and Media. The Geographic Breakdown is as follows United States (39.7%), United Kingdom (12.3%), France (10.3%), Germany (6.9%), Switzerland (6.5%), and Other (24.3%). Investing Risks include market risk, value style investing risk, merger arbitrage securities and distressed companies risk, foreign securities risk, smaller and midsize companies’ risk, derivatives risk, and management risk.